It is once again a busy time along the floodplains of the river IJssel, where we saw the Wigeons a few weeks ago. 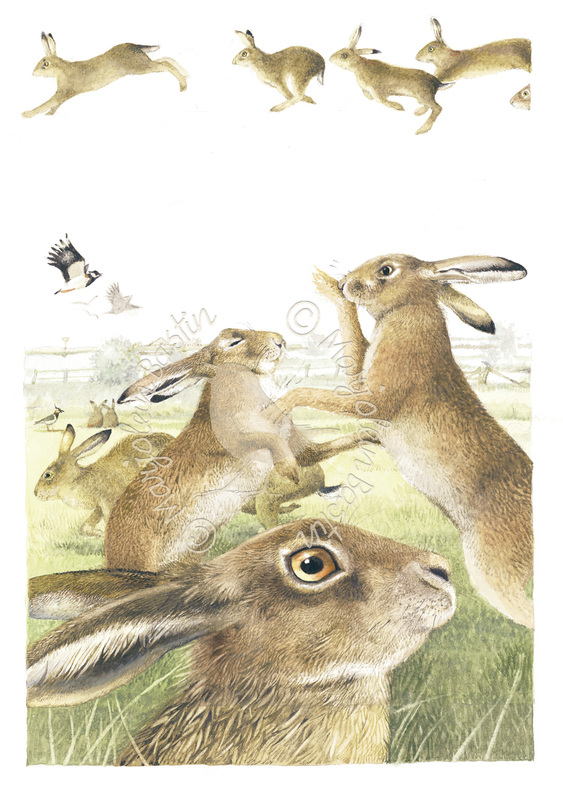 This time the male hares are fighting over the ladies. These guys don’t take it easy on each other. While standing on their hind legs they are punching each other, just like boxing! Male hares are known as bucks, and the females as does. The victor of the latest boxing match sits proudly next to his prize when he is immediately put back in his place. Two new males arrive on the scene and the boxing starts again. And yet another buck approaches the doe, who promptly runs off. All the males quickly follow. The competition between the bucks takes place every spring and is known as “March Madness.” A party in the pastures! Approximately six weeks later the young are born. The mother gives birth to the young out in the open, in depressions in the grass and they are fully furred and their eyes are open. Just once a day, for about five minutes, the doe returns to nurse the young. Luckily, hare milk is high in fats and protein.